If you are not reading this book, then you are missing out on what is turning into a truly amazing comic. Brian K. Vaughan (Y: The Last Man) and Fiona Staples (Northladers) have created Saga, a science fiction story about Alana, Marko and their newborn baby Pico. Marko and Alana come from two planets embroiled in a universe spanning war. The family is trying to get to the “Rocket Ship Forrest” – a place where they can raise their baby without having to worry being in a war zone. This issue is centered around another character, a Freelancer (or bounty hunter) named The Will. He makes his way to a planet called Sextillion, a place where anything and everything is for sale. The Will has an interaction with the alien who runs the planet. Sensing that Will can’t find what he is looking for, he takes The Will into the Inner Core. Here we learn The Will might not be as bad as we thought. The alien presents him with a six year old slave girl. Without hesitation, The Will crushes the skull of the alien and saves the little girl. The story itself is fantastic. Vaughan has the skill to take this far out story and somehow make it very personal. What would you do to protect your child? What would you endure? It’s his ability to combine the science fiction and personal elements that make this book so amazing. As good as Vaughan’s storytelling is this story wouldn’t work without Fiona Staples’s art. Her “sketchy” style works perfectly when she’s trying to show emotion in the faces of the characters. She is able to bring a human element to the people in the book. I can’t imagine this book looking any other way. If you are a science fiction fan, do yourself a favor and go find these issues. They are only four issues into the series. Buy them online if you have to. 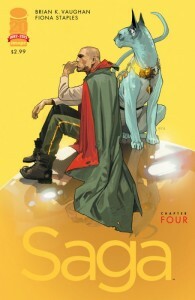 Saga is one of the best creator owned series out right now. Go out and support the hard work Vaughan and Staples are doing. You won’t regret it.